Now, Ruckus Wi-Fi systems can be securely controlled, monitored, and upgraded from anywhere in the world, over the Internet or a private IP network—with FlexMaster. It's the industry's only complete management platform for building and managing both Enterprise and Carrier-Grade Wi-Fi Service Infrastructures. The Ruckus Wireless FlexMaster Management System is a fully-featured, intuitive, and complete, Linux-based managed service platform for configuration, fault detection, audit, and performance management of hundreds of thousands of remote Smart Wi-Fi APs or Smart Wireless LANs (WLANs). 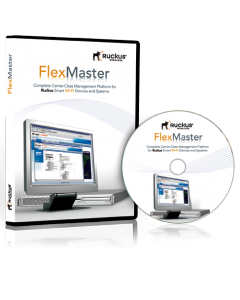 FlexMaster is a Wi-Fi management platform for enterprises of all sizes. It enables network administrators to perform all critical functions necessary to set up, maintain, and optimize the deployment of their business Wi-Fi networks—all from a single point.